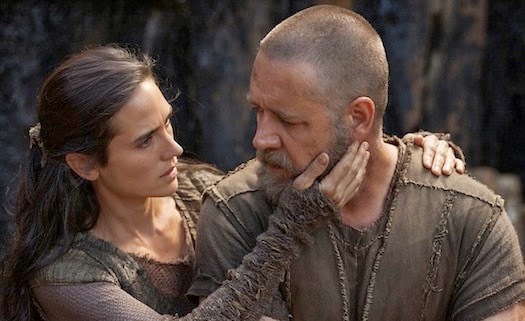 The book is nearly always better than the movie, and Darren Aronofsky's fantastic Noah is no exception. But this doesn't mean the movie isn't a worthy work of artistic merit on its own. A dream project for the filmmaker, Noah is the filmic mashup between a Narnian-like fantasy story, a Shakespearian family drama, and a Biblical morality tale, all rolled into an epic cinematic experience. More than anything, Noah raises deep spiritual questions, and invites discerning viewers into discussion and exploration of moral themes and paradoxes. These paradoxes include God's justice and mercy, God's presence and transcendence, and humanity's beauty and depravity. Noah embraces the tension, mystery, and complexity of these realities. This is not your Sunday-school Noah, with flannel-graph happy animals gathered on a boat beneath a rainbow. Grim and gritty, Aronofsky depicts Noah (Russell Crowe) as a tortured soul, a man striving to remain faithful to the Creator and care for his family, while also embracing the difficult task of being a key figure in the destruction of humanity. In the midst of the tragic cosmic drama involving the flood over the earth, there is also the intimate familial drama in Noah's own kin. Noah's wife and sons--particularly Ham (Logan Lerman)--struggle with their father's mission to create the ark and participate in God's act of judgment, and the family conflicts arise due to Noah's decisions. Noah asks difficult questions unspoken in the biblical narrative: What would Noah's family have thought about his decision to build an ark? What about leaving humanity behind? What were the interactions like between Noah and the rest of wicked humanity? How did the animals get on the ark and stay there? Did Noah ever doubt his mission? Did he experience survivor's guilt? How did Noah and his family actually go about building the ark? What about the Genesis 9 account, where Noah plants a vineyard and gets drunk--why include that story in Scripture? Do other biblical characters, like Tubal-Cain, Lamech, or Methuselah, play a role? Who or what were the Nephilim? Noah addresses many of these questions with fantastic imagination and scope, painting an image of an epic Middle Earth-like world of cinematic beauty and darkness. While many are annoyed that the filmmakers made a midrashic interpretation of the biblical narrative of Noah, looking at Jewish commentaries as source material, I found little, if anything, in Noah contrary to the truths found in Scripture. The story of Noah covers only four chapters in Genesis; Noah literally doesn't utter a word in the biblical story until Genesis 9, where he calls a curse and blessing on his sons. It's a story ripe for adaptation and expansion through the medium of film. While the third act of Noah addresses themes more akin to the Abrahamic narrative, the final message of God's justice and mercy rings true, for Christian and non-Christian viewers alike. Despite its gritty violence--and it is quite violent, so squeamish viewers beware--Noah has wonderfully affecting moments, particularly with Noah's grandfather, Methuselah (Anthony Hopkins) and Noah's adopted daughter, Ila (Emma Watson). While Ila isn't found in the biblical narrative, her interactions with Noah in the film are particularly profound, where the viewer is reminded of the beauty of mercy when it is offered freely to another. I wept during a conversation between Ila and Methuselah, where he reminds her that she is a gift from God and not a burden. Would that every young woman who doubted her value and beauty heard those words: you are a gift! Noah's wife, Naameh (Jennifer Connolly, who again finds herself as the spouse of an obsessive vision-seeing man portrayed by Russell Crowe), is a strong character next to Noah, offering him support and comfort from the weight of his task, while also pushing back against him in the third act, where the film takes an increasingly dark turn through Noah's decisions. Noah is described as a righteous man in the Bible, but does this righteousness mean Noah is sinless? Of course not. He is a good man, a faithful man, but he is also a sinful man. Noah confronts this in a scene where Noah looks at the violence and depravity of the human race doomed for destruction, and realizes he is one of them. As the ark passes through the waters and the screams of humanity hit the ears of those on board, the weight of God's justice is tangible. We have all sinned and fallen short. It's only by grace that we are saved, and Noah offers a beautiful vision of grace as the remnants of creation experience salvation through the ark. In a culture of secular humanism, where science and atheism put the spiritual realm on trial, and the human heart's intentions and motives are always deemed as "good," Noah has the courage to reveal both the depths of human depravity and the beautiful spiritual existence of a merciful God. Is God in Noah? Absolutely. Some disagree, as He is only referred to as "the Creator" throughout the film. Yet is this title inaccurate or false? Certainly not. God is Creator, the Author of all creation, and His glory fills the whole earth. Does God speak in Noah? Some are up in arms about the apparent silence of God as characters cry out to the sky for the Creator and get no response, as if God is distant, aloof, or non-existent. But what do these viewers expect--an audible voice from the sky? Have they ever experienced an audible heavenly voice during their personal times of prayer? I certainly haven't. I, too, have screamed and cried out to the heavens in hopes of an unambiguous answer to my prayers. God's response is never quite what I expect, and it's never been an audible voice from the clouds in my experience. God speaks in stirrings, murmurs, ponderings, the stillness and quiet. I recognize that it would be much easier and more comfortable, both for the film and for our present reality, if God's voice were clearly audible every time. But it isn't. We wrestle, we listen, we wonder if we're hearing God correctly, and we try to remain faithful and obedient, even when His voice isn't perfectly clear. We go back to what we know He has said--we turn to Scripture and listen for His heart in the stories and commands. Noah does the same; he repeatedly refers to the Creator's commission to fill the earth and care for it, be fruitful and multiply, to reflect His image and glory throughout the earth. God's grace ultimately shines through, piercing through the cloudy sky with a brilliant radiance. "...we treated Genesis as the word of God, as complete truth. We were trying to bring that story to life so we didn’t want to contradict anything. We wanted to represent everything that was there and let it inspire us to tell a dramatic story with the themes and the ideas that are in there." This adaptation of God's word brings about another question--what makes a story true? Is it the adherence to the literal words of Scripture, using the biblical text as a sort of script? Some folks in Christian circles are upset about the opening of Noah, where the words, "In the beginning, there was nothing," are the introductory words on the screen. That's not what Genesis 1:1 says! they exclaim. They changed the verse to take God out of the statement! Yet the exact same words are the opening lines to the Creation account in the wonderful children's book, The Jesus Storybook Bible, by Sally Lloyd-Jones. I don't recall such a strong reaction for Lloyd-Jones' adaptation of Scripture. Is The Jesus Storybook Bible true? What about Son of God or God's Not Dead, two other recent films filled with Christian themes? What is true here? is a valid question to ask of our beloved stories. If God is the source of all truth, then anything and everything we encounter to be real and true finds its roots in God. I would contend that Noah is full of spiritual truth for those with eyes to see and ears to hear. The themes of mercy and justice are prevalent, as are realities of a spiritual realm and a divine Creator. Perhaps truth in this case goes beyond historical accuracy or literal adherence to the exact phrasing in Scripture. This isn't to say that truth is relative or only experiential or entirely language-based. It's only to say that truth cannot be limited to the words of a page, as Truth is ultimately embodied in a person, Jesus Christ. We need to read the Bible more literarily than literally, and I hope that a film like Noah inspires people to explore the redemptive story of Scripture with renewed vision and passion. If the film motivates someone to read their Bible, I'd consider that a favorable outcome. For any movie that has Christian themes or a Bible-based story, followers of Jesus have a unique opportunity to bear thoughtful witness to the God we worship. The key word here is thoughtful. So often our reactions to such films are knee-jerk and excitable--we either buy out the theatre and fashion whole sermon series in absolute praise of a film, or we boycott and decry it with religious zeal, pointing out how "unbiblical" it actually is. I'm particularly speaking about my own tribe of evangelicalism and our tendency to mindlessly consume or mindless reject particular works of art. This is a regrettable habit, but the real tragedy comes when we not only reject the work art, we also reject the people whose opinions differ from our own. To navigate the grey areas of our world with discernment, thoughtfulness, and tolerance--yes, tolerance!--from a posture of humility and love will be an incredible witness to the life-changing power of Jesus Christ. In a culture defined by division and partisanship due to humanity's obsession with self-proclaimed influence and voicing personal opinions as facts, we can stand out as beacons of gracious moderation while holding fast to our values and humbly pointing people to truth. In our conversations about Noah, both in the physical and the online realms, let us strive as evangelicals to be known as thoughtful and gracious, not reactionary or ill-informed. In the end, Noah isn't a perfect film, but it's certainly a fantastic film, in both senses of the word--extraordinarily good and imaginative and fanciful. For those who are hesitant about Noah--particularly those who claim it isn't "biblical" enough--I would invite them to watch again with open minds and hearts, seeking truth and beauty in the flood of this tale. Noah reminds us that we are broken and beautiful, depraved and good, bearing the weight of our sin and the image of God in our souls. It calls us back to Eden, recognizing that we cannot create or enter paradise on our own--we need a Savior who looks upon us with favor, one who will carry us through the waters out of death and into life. -My personal favourite review of Noah, from Brett McCracken at Converge, who discusses Tim Keller, Charles Spurgeon, and Gerhard von Rad in his review. -Alissa Wilkinson at Christianity Today offers her main reasons why you should see Noah as a thoughtful work of art. -Stephen Greydanus gives an extensive commentary in his review at the National Catholic Register. -The strongest and most thoughtful negative review of Noah I've read, from Kenneth Morefield at his blog. -Peter T. Chattaway has written the most in-depth and comprehensive write-ups on Noah from the very beginning, literally years before the film was ever made. 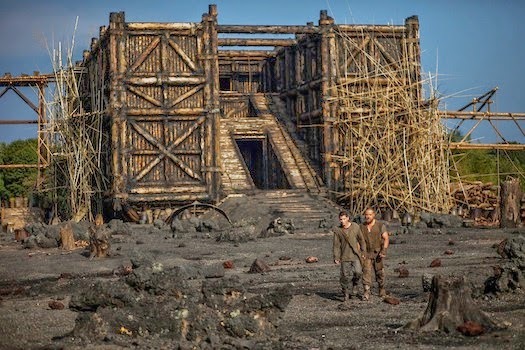 His first and second impressions of the film, articles on why Noah isn't Gnostic, an examination of the snakeskin imagery, and an interview with Aronofsky and Ari Handel.